The holidays are a wonderful time of year, especially for those of us who enjoy food! 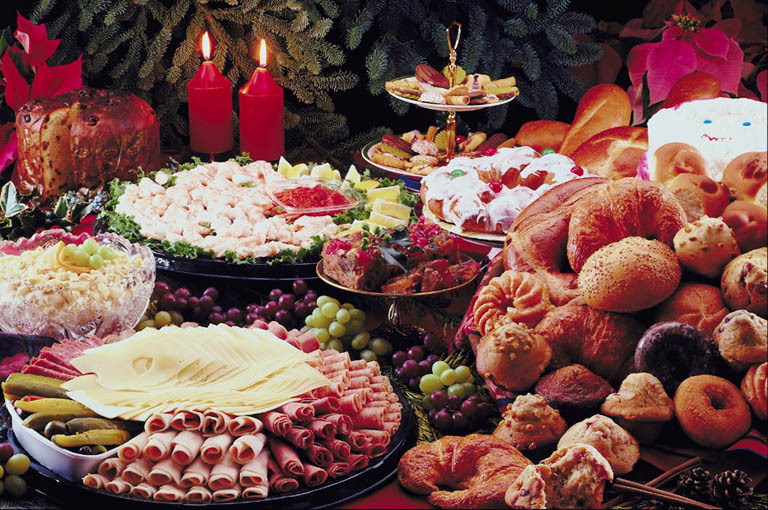 Traditional holiday food is tasty but often high in calories, sugar, fats and sodium. This can present a challenge to those who have diabetes, heart disease, hypertension, or other chronic conditions that need to be managed with healthy meal plans. Fats can be reduced in baked products by ¼ to 1/3. For example, if a cookie, quick bread or muffin recipe calls for 1 cup oil, use 2/3 cup instead (this method should not be used for yeast breads and pie crusts). Fats and oils add flavor and moisture so decreasing any more than 1/3 could result in poor products. Use vegetable oil instead of solid fats such as lard, shortening, and butter. Solids fats, also know as saturated fats, can be detrimental to your cholesterol levels. When substituting vegetable oils for solid fats in recipes, use ¼ less than what is called for in the recipe. For example, if a recipe calls for 4 tablespoons of butter, use 3 tablespoons of oil instead. Use plain lowfat or nonfat yogurt instead of sour cream. If replacing 1 cup of sour cream with 1 cup of yogurt, you can save up to 44 grams of fat! Use skim or 1% milk instead of whole or half and half in recipes. By replacing 1 cup of half and half with 1 cup of skim you save 25 grams of fat. Replacing ¼ to 1/3 of sugar in baked goods with artificial sweeteners or flour can help lower carbohydrates (do not use this method for yeast breads). Adding spices such as cardamon, cinnamon, nutmeg, or vanilla will also enhance sweetness. Add fiber such as whole grains instead of highly refined products. Fiber aids digestion, slows absorption of carbohydrates, and can lower LDL cholesterol. Use whole wheat flour, oatmeal and whole corn meal. Whole wheat flour can be substituted up to ½ of all purpose flour. Please be aware that diabetic individuals can eat any type of food as long as it fits into their diabetes management plans (balancing carbohydrates, medication, and exercise). Therefore, when preparing holiday meals and snacks for diabetic individuals it is especially important have information on serving sizes and associated grams of carbohydrate or calories. Keep in mind as well that many products labeled as “sugar-free” still have carbohydrates and can raise blood sugars!